Andrew Rodriguez’s “Mediocrity in America: A Point of View.” A warning has been issued to future generations about mediocrity in America and the fragility of freedom. Will we walk through life without teaching and without learning? Will we become a dogmatic, narrow-minded, inflexible group to fill the vacuum and establish a paralyzed society that will disintegrate as mediocrity becomes the norm? 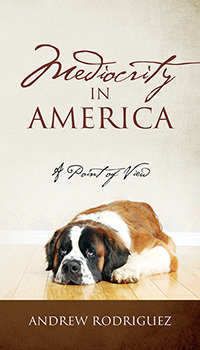 Told by a St. Bernard doggy guru named Titan, this narrator makes a compelling case against these dangers. Previous Previous post: Your Book Can Make a Great First Impression with a FREE Custom Cover! Next Next post: Errors-B-Gone: How Can I Clear My Manuscript of Mistakes?